I’m so so excited about today’s Figuring it Out installment! 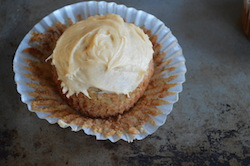 Meet my friend Sarah Gerrity, who writes the beautiful food blog Sweetsonian. 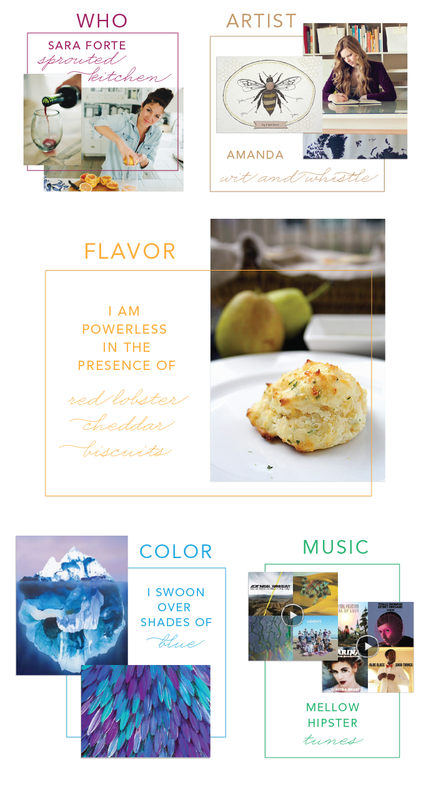 It’s easy to get lost in Sarah’s recipes, stories, and photos, but she’s also a super talented graphic designer and is always surprising me with how talented she is. It’s also Sarah’s birthday today! So help wish her a happy birthday with me and check out her great advice below. What do you do now? Is there anything on your list you still want to do? By day, I’m the Multimedia Editor for the Department of Energy – and I absolutely, positively, couldn’t-be-happier love it. By night, I work as a freelance designer, mainly for Google and Visual.ly. And when I’m not completely wiped of all creativity, I mix, sauté, bake, and blend for Sweetsonian. Most of my work revolves around designing infographics. Career highlight? Barack Obama retweeted the very first infographic I designed. I’m pretty sure my life peaked at that very moment. I do a bit of freelance photography and logo design, but designing infographics is what I give up sleep for. Person: Sara Forte of Sprouted Kitchen. I love love love everything she writes and cooks. Music: Mellow hipster music – if that doesn’t make sense, you can check out my Spotify playlists here. When did you realize something you liked was actually one of your passions. What did you decide to do with it? My last job was working as a communications assistant at a little international development nonprofit. Initially, I planned on somehow transferring into their Middle East department, so I could actually use my Arabic degree and work on development programming… but after six months, I had learned so much about communications, and it was like I woke up one day and realized that I had redesigned everything at that nonprofit… flyers, emails, newsletters, you name it. That day. That was it. I decided to be a designer, and I decided to put 200% into being a designer. I designed things day and night until I found my design style, and eventually finagled my way into my job that I love. Tell us about a risk you’ve taken in the process of figuring it out. Something that always felt like a huge risk to me was making decisions entirely based on what I wanted and needed in my life — being selfish. Putting your own needs first can be scary on several levels: I worried about how people might react and how people would see me. But the truth is, sometimes, we all need to put ourselves first — in our careers, in relationships, and in day-to-day life. Understanding the reality of when it’s okay to put yourself first and when you can put others first is something that took me years — a college degree, two coasts, and three different jobs — to figure out. Sometimes I need to cloister myself for a weekend to finish a few projects, and sometimes, I need to say “no” to some of my clients. But all the time, what I really need is to spend a day cooking something fabulous for my closest friends. What are the biggest obstacles that you have overcome to get to where you want to be? And if you aren’t there, what are your fears in getting there? As a self-taught graphic designer, my biggest mental hurdle was getting over the fact that I didn’t have any sort of academic background in art or design. Before I started my current job, I interviewed for 23 different jobs in one year, and nothing was really a good fit. Designing infographics at the Energy Department was my big break – and it felt weird to call myself a designer, even though I had been designing things all day, every day for more than a few months. This might sound ridiculous, but after about six months of day-and-night design work, I had to cave. Everything just felt right. 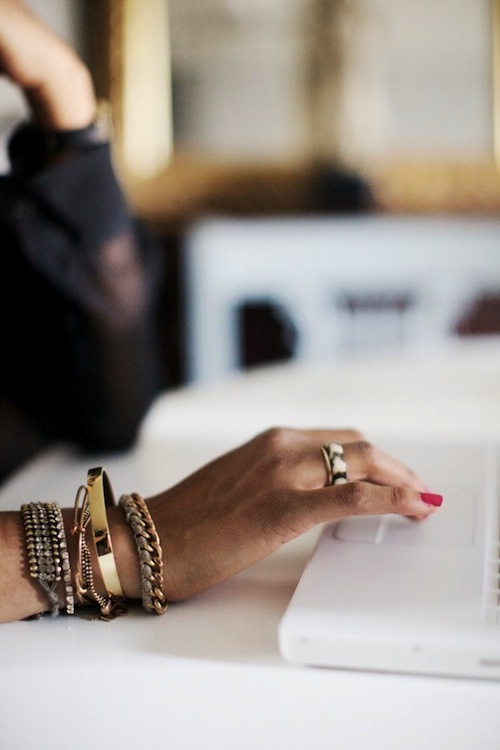 How does blogging help you figure it out? With my current work, I create things 24/7 – for the Energy Department, for Google, for other clients, etc. Sweetsonian is the one place in my life where I have the ultimate say, so these days, my blog is my form of creative release. I’ve been a writer as long as I can remember, and writing is something that helps me figure out what’s going on in my life – what’s stressing me out, what makes me happy, and what I need to really be focusing on. 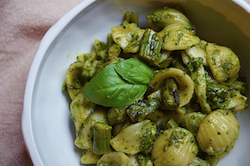 Oh, and blogging helps me figure out what I want to eat for dinner. And breakfast, lunch, and dessert. Read more from the Figuring it Out series! Posted May 2, 2013 in Inspiration by Nikki. I’m excited to share another great installment of Figuring It Out with someone who I’ve admired for some time now. Lindsay Souza blogs about fabulous spaces and beautiful things at The Pursuit of Style and has such a refined eye for color and design. Not only do I love that she’s also a DC gal, but she’s someone who embraces color as much as I do. Lindsay just recently started a new job at Haddon Interiors, taking her love for interior design one step further, which is why she’s perfect to hear from on this subject. Currently I work as a design assistant for a local interior design firm, Haddon Interiors. I think my Olympic dreams have been tempered by reality, but I do still daydream about one day opening a boutique. I’d love to have a small storefront that would also be home to my interior design office. Person: I’m inspired by strong, creative, women with distinctive personal style and unique points of view. 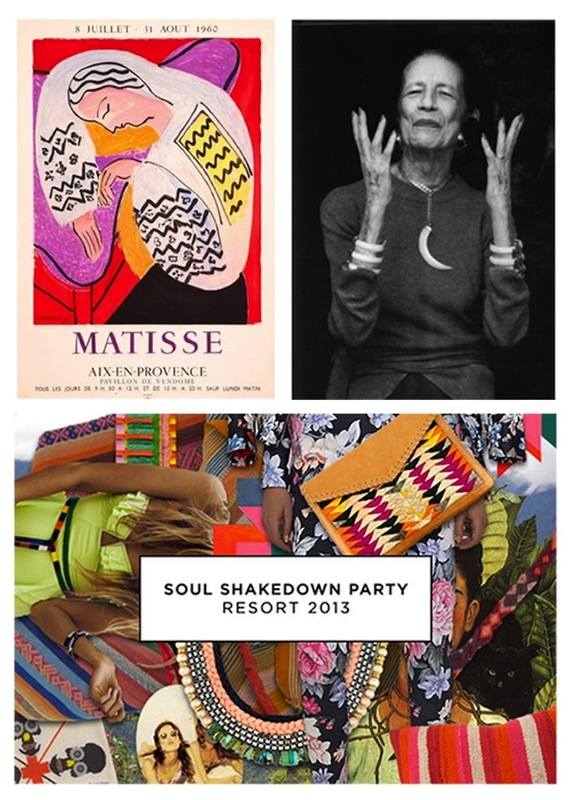 If I had to pick just one, I’d go with Diana Vreeland. Flavor: Something inventive and unexpected. I love when chefs push the envelope. Music: Lately I’ve been listening to Edith Piaf. It almost transports you right to Paris. Truthfully, it took me a long time to have my ah-ha moment. Even then, it wasn’t really a moment, but more of a slow realization process. I think I was a little scared to admit it to myself because it was never a path I had considered. 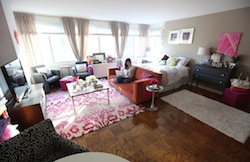 I was spending all of my free time devouring interior design books, blogs, and shelter magazines and pouring my disposable income into decorating, and re-decorating, our tiny apartments My friends and family probably recognized my passion for design first and with their encouragement I started to see it as something I could actually pursue. Deciding to be open to the possibility rather than dismissing it outright was the first big step for me. Taking a leap of faith and leaving my job (albeit one I didn’t love) a few months ago to essentially start over in a field I had zero formal experience in was terrifying and exhilarating at the same time. One minute I’d be completely thrilled and the next I’d be overcome with self doubt and thoughts of “am I really doing this?” Thankfully, I couldn’t be happier with my decision and actually look forward to going to work now! I think the biggest obstacle I need to overcome is getting out of my own way. I’m my own biggest critic and sometimes I need to ease up a bit and realize I’m still young and it’s okay that I’m still figuring it out! It’s funny, I kind of think of myself as an accidental blogger. 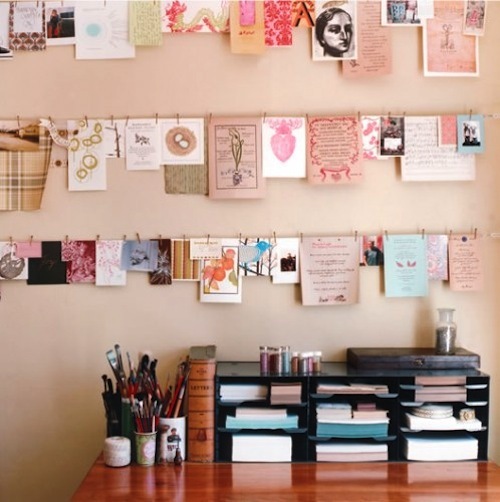 When I first started I didn’t give it much thought or really have any aspirations for the blog other than for it to be a way to catalog the things that caught my eye (ohh the days pre-pinterest). I certainly never imagined it would introduce me to such an amazing, inspiring, and supportive community! In that respect blogging has helped me immensely. Its exposed me to so many new things, provided a much needed creative outlet and platform to experiment and refine my aesthetic. Posted March 28, 2013 in Inspiration by Nikki. Time to bring back Figuring it Out – and with a blogger whom I admire so much! 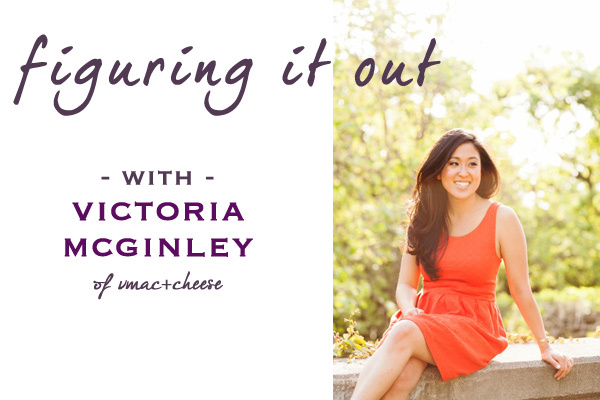 Victoria McGinley of vmac+cheese is great inspiration. She works so hard and crafts her work into something really special for herself and for her readers. I’ve gotten to know her a bit and I adore that she genuinely cares about building community and helping others succeed. I also love that blogging is a big part of how she figures it out and even inspired her to start her creative services business Vivaleur. Person: I find I’m most inspired by people (especially women) who are whip smart, well read, fearless, strong leaders, funny, risk takers, and dynamic, and can do it all with a sense of style, flair, and self. 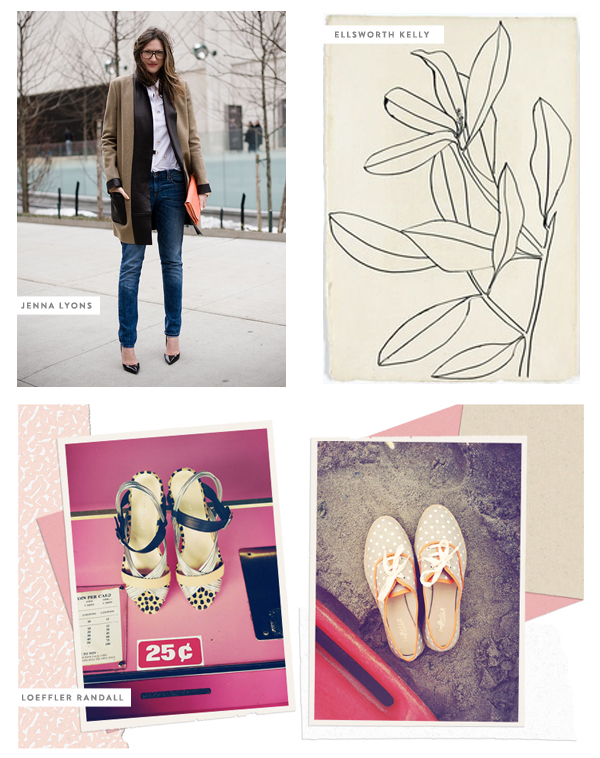 Brand: I’ve kind of been a J.Crew girl since about age 15, so I guess I’ll choose them. They are pretty fantastic at reinventing themselves! Flavor: Food with lots of varying textures. 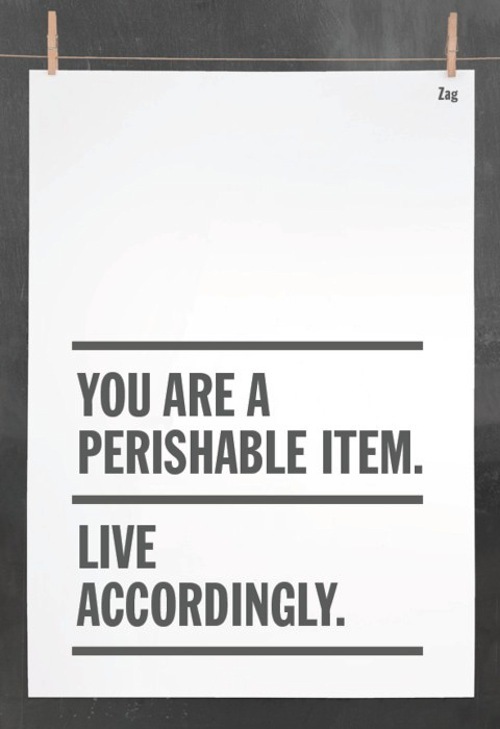 Artist: With the advent of the Internet and e-shops, too many to even list! That’s kind of the way I feel about the entire blogging gig. A hobby that requires you to be creative, write well, hone your graphics and photography skills, stay up to date on the latest happenings in culture, connect with other women, help them when you can, and be part of a community of people who have the same interests as you? Um, let’s make that a JOB, not a hobby! I think quitting my job last year was a pretty big risk, although I think I had taken the necessary steps to ensure it wasn’t a stupid risk. I’d saved money for months, had written a solid business plan, established a small client base, and probably most importantly, gathered support from friends and family. Getting out of my own way. Sometimes it’s so easy to get caught up in your own head, considering all the what ifs and what abouts. The best way to get anything done in your own life, whether it’s a small errand or a major life overhaul, is to just roll up your sleeves and get to work. I think once I stopped wanting things to change overnight, ironically, I was able to see change more quickly. Blogging is such a great platform to experiment. I can try new ways to approach content, learn more about the industry, and then share what I’ve learned with other people. Not only that, blogs provide such an excellent network of friends and supporters. I can’t imagine life without it! Read all Figuring it Out features. Posted January 16, 2013 in Blog by Nikki. I’ve been loving the feedback and conversation about this series. I’m glad this is a topic we can all share. It’s just good to know we’re not alone in the whole “I have no idea what I’m doing with my life” thing. 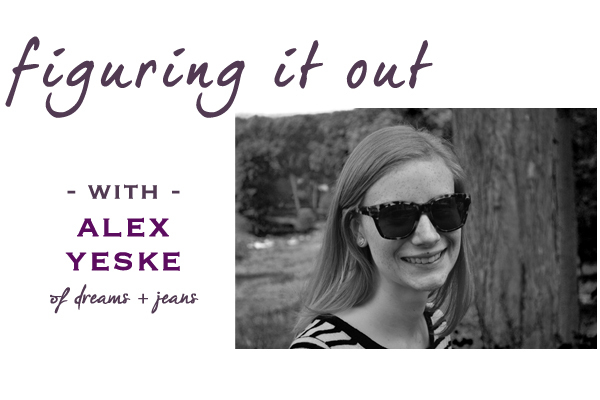 Today’s interview is with the sweet and talented Alex Yeske of Jeans + Dreams. Her blog and aesthetic is refined and fun and I admire how she ambitiously values networking with people you admire. That’s something we can all do more of to get where whenever we want to go. I am a graphic designer at Madewell and do a little bit of freelance design work in addition to blogging. I think I would still love to do any of the things on my list, except maybe not the roller-skating waitress – not sure I have the coordination for that! 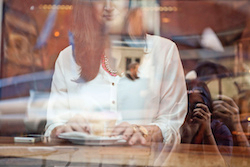 Person: it’s a cliche blogging answer, but Jenna Lyons. I have interviewed with her and attended meetings with her, so I can honestly attest to her inspirational nature, amazing fashion sense and sharp intelligence. Color: always black + white. love a pop of coral and chartreuse too. Growing up I was always interested in fashion, but never thought I could actually be a part of it without being a fashion designer. I admired a lot of brands and wished that I could work for them and it wasn’t until I got into branding and graphic design that I realized I could actually take my skillset and get into fashion that way. I can’t recall a large risk, but I’ve taken lots of small risks throughout my internship and job hunting process. I wasn’t afraid to put myself out there and reach out to people who had jobs I admired and it ended up paying off in most instances – my current position is a direct result of hard networking! For where I am now, I’d have to say one of the biggest obstacles was making it through my intense design program at Syracuse. It’s design bootcamp and you either sink quickly or learn how to swim. It’s such a difficult major to get through but so rewarding in the end because we have such a unique skillset compared to other graphic designers graduating from other programs. Looking down the road, I have a lot of ideas of new things I’d like to do and projects I’d like to explore. My fears are definitely of failure, but at the same time I have fears of not doing these new things. Blogging helps me figure it out by allowing me a place to record my thoughts and interests, as well as meet and network with others who share similar goals and ideas. It’s a great testing ground too to see how things resonate with readers that can inform future decisions. Blogging helps me stay in tune with all of my goals outside of my day job and graphic design – it helps me not lose sight of my other dreams. Posted November 29, 2012 in Blog by Nikki. I’m glad to bring back Figuring it Out today. Especially this week when you’re reflecting on this past year and thinking about what everything means and what might come next. We all can use a little guidance. 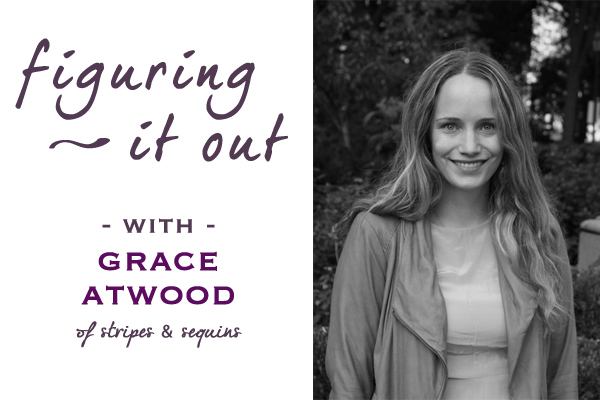 Grace Atwood of Stripes & Sequins is a super blogger. Not only does she rock the DIY and jewelry making with effortless style, she is just beyond sweet. (Like to the point where I’m even surprised. It’s so refreshing.) She’s got some serious poise. And grace, of course. Which are only just a few things I think we can learn from her. I do a few things. My day job is director of social media for BaubleBar.com, but I consider my blog Stripes & Sequins to be my second job. I’m always making jewelry… I still dream of someday launching my own jewelry line! 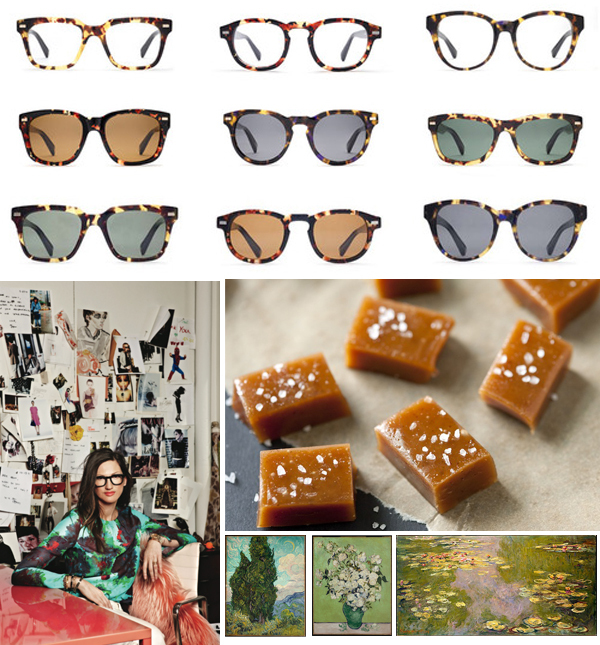 Brand: Warby Parker, because everything they do is done so well. Music: I love all music but I do some of my best thinking when classical music is playing. Artist: It’s not very original, but love the impressionists. Van Gogh, Monet.. I could spend all day wandering the impressionist section of the Met. I never realized that playing on the Internet could turn into a career! I was astonished when I realized that people were making careers out of social media. Three or four years ago, that would have been unheard of. A year and a half ago, I left a very stable, relatively high-paying career in the beauty industry to work for BaubleBar.com, which was (at the time) relatively unknown. It definitely raised a few eyebrows but I believed in the brand so much that I knew I was making the right decision. My biggest obstacle right now is time. There just isn’t enough of it. I have so many goals and things I want to achieve, but it is tricky as I work about 50-60 hours a week at BaubleBar and spend another 20 or so working on this blog. Add in a life, a relationship, and attempts at downtime and there isn’t time for much else. I’m just afraid that I’ll never have the time to do the things I’m really passionate about (like eventually launch my own jewelry line.) I take things day by day… and I know eventually I will get there. I think one of the tricks is to realize that it’s okay to take things slowly… step by step. You don’t have to have it all right at once. The blogging world is a majorly inspiring one. I’ve met so many amazing women who have challenged me and pushed me to become a better, more entrepreneurial version of myself. And in blogging, I’ve really been able to push myself creatively, which is so important. Coming up with content for collages, weekly DIY projects, and styling outfits forces me to live a far more creative life than I would be living if I were not blogging! That’s really why I blog… if I didn’t blog, I don’t think I’d be nearly as creative. Posted November 20, 2012 in Inspiration by Nikki.